Twig is a beautiful, dark yellow female – 55 pounds of pure muscle and power! She is a very fast, focused dog who is quiet in the house and easy to live with but revs way up for training. 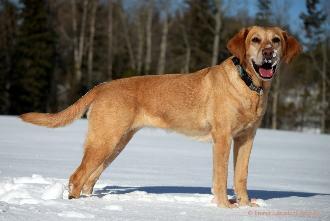 Twig gives 110% whether it is retriever training, agility, tracking or sledding. She has earned her Advanced Games Dog of Canada agility title and is now officially retired from competition. 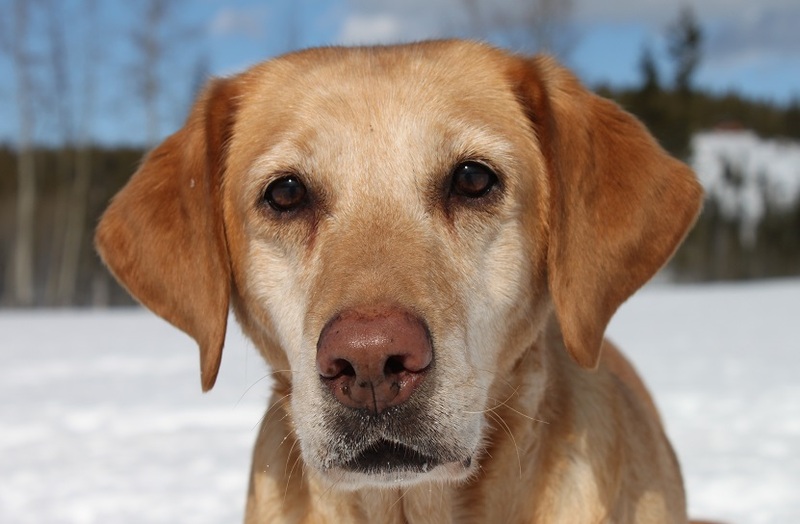 At age 12, Twig still enjoys her daily hikes, light training and grouse hunting. Twig is also an outstanding hunting dog and has particularly strong water work. Besides her good looks and outstanding drive, Twig has earned a lot of attention for her wonderful demeanor. She lives to please and has been a very easy dog to train. Twig plays gently with children and small animals but has a big bark and is not afraid to put herself between her family and danger (for example, there was the time she scared off the grizzly bear that was just a few feet away from me in the bushes!) She is physically tough and has no reservations about crashing through dense bush, icy water, or through other factors to get a bird. When she isn’t training, hunting or competing, Twig’s favorite past-time is snuggling on the couch under a blanket. Twig has produced three litters for us – 2 sired by Prairiestorm Hawk, and one by our Chester. Her puppies are extremely athletic, intelligent, and have more natural bird-finding ability than any I have ever seen. Both of our ‘keeper’ puppies from her 2009 litter were hunting grouse at 8 months of age. Twig puppies are titled in hunt tests, flyball, agility, working certificates, and dock diving.